Frontline Plus has been in the market for almost 15 years now and has earned the trust of various customers worldwide. It has proved its reliability and still continues to be the first preference for flea and tick treatment. The treatment contains fipronil and s-methoprene that work synergistically to kill not just the adult fleas and ticks but their entire lifecycle within a period of 12 hours after the application, protecting the pet from further infestations. Frontline Plus is also known as a potent tick controller because it kills 4 major types of tick species – American dog ticks, brown dog ticks, lone star ticks, and deer ticks. Another advantage of using Frontline Plus for flea and tick treatment is that it is a waterproof solution and thus won’t get washed or lose its efficacy once dried completely. Product price is quite cheap compared to the chews or other products for flea and tick treatment that are available in the market. Is safe for use in puppies and pregnant or lactating mothers. Frontline Plus also eliminates chewing lice and is highly convenient to use which is why it is customer’s favorite. You don’t have to worry about chasing your dog for taking the pill. Just apply it between the shoulder blades, on the skin and you are done. 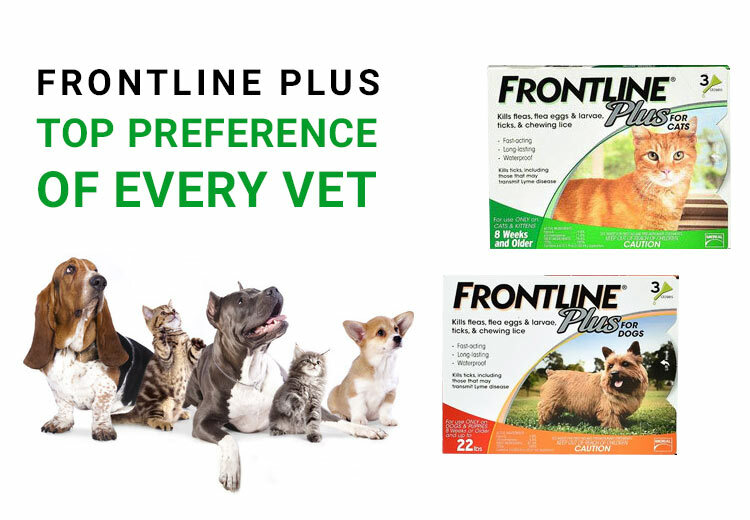 Frontline is available both for dogs as well as cats. Though the market is now flooded with numerous types of flea and tick treatments, it is the brand name that has earned frontline plus this reputation for being super-efficient and completely safe for use in both cats and dogs. So, if you are in a dilemma as to what treatment you must choose to treat your pet, your answer is here. Well, do consult the vet before administering any sort of treatment though.